Warren Buffett? Jim Rasmussen? Apocryphal? Risk comes from not knowing what you’re going. I have seen low quality citations in secondary sources from the 2010s. Can you help me to find a good citation for this comment? Quote Investigator: In 1993 Warren Buffett spoke to graduate students at Columbia University’s Business School in New York City. Reporter Jim Rasmussen wrote about the event in January 1994 in the “Omaha World-Herald” of Nebraska. And it was being run by honest and able people who all had a significant part of their net worth in the business. It was ungodly safe. It wouldn’t have bothered me to put my whole net worth in it. Not in the least. Interestingly, “The Washington Post” and other newspaper and media organizations have become riskier assets in modern times because of internet induced turmoil. Amazon leader Jeff Bezos purchased the paper in 2013. The accompanying footnote pointed to the “Omaha World-Herald” article. 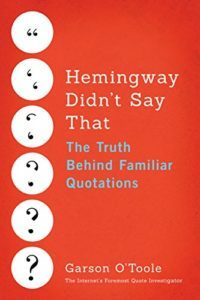 The text between quotation marks was taken from the newspaper piece although it was compressed; some of the phrases were not originally adjacent. His annual letters have long been scrutinized and combed over for pearls of wisdom. While Warren Buffett has not said much on smart beta specifically, an investor evaluating smart beta approaches can still find wisdom and lessons in his words. In conclusion, Warren Buffett should receive credit for this statement based on the January 1994 citation. Image Notes: Portrait of Warren Buffett at the 2015 SelectUSA Investment Summit; image accessed via Wikimedia Commons. Picture of 3-dimensional graph from PublicDomainPictures at Pixabay.